Fairchild Semiconductor has long been the market leader for 300V N-Channel MOSFET products, but they are being challenged by new devices from IR (International Rectifier). These chips are typically used for high efficiency industrial applications such 110-120 VAC line conditioners, 110-120 VAC power supplies, mid-range wattage power supplies, DC to AC inverters, solar panel inverters and Uninterruptible Power Supplies (UPS). Fairchild uses an advanced “Planar” technology for their transistor geometry, called “UniFET”. They promote this as having lower input and output capacitance and best-in-class reverse recovery for a better Figure of Merit (FOM) (where FOM = Rds(on) * Qg). This similar to their “QFET” process technology. International Rectifier’s “Hexfet” family of MOSFETs derives it’s name from the hexagonal shape of the transistors used on the silicon die. This geometry allows IR to increase their channel density which provides a lower silicon area for the same power. This translates into a lower cost device as well as improving the Rds(on) characteristics. The tables below show the RDS(on) (Max) and Qg (Typical) at 10Vgs for comparison. IR has released three devices which are available to purchase at this time. Pricing for the IRFP4137PBF starts at $1.64 each in 10,000-unit quantities. 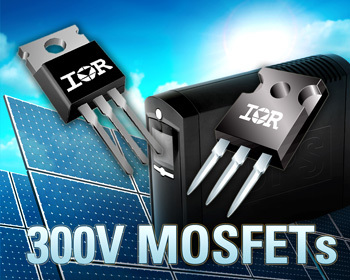 300V MOSFETs from IR and Fairchild are industrial grade qualified with moisture sensitivity level 1 (MSL1). Packaging is lead free and are RoHS compliant. Was this interesting / informative ? Do you have a product you’d like reviewed? Give us your feedback in the comments. Don’t forget to sign up for our weekly e-newsletter as well as daily email / RSS feeds at SourceTech411 .